Trillian for Mac works great alongside Trillian for iPhone. Just like you'd use iTunes to update your music on mobile devices, with Trillian for Mac you can manage your contacts and connections and send the updates right to your iPhone. Trillian for Mac is a fully-featured IM and social client, with all the usual Trillian concepts you're accustomed to -- connections, a connection manager, a contact list, tabbed chats -- helping you easily migrate from Windows to Mac. 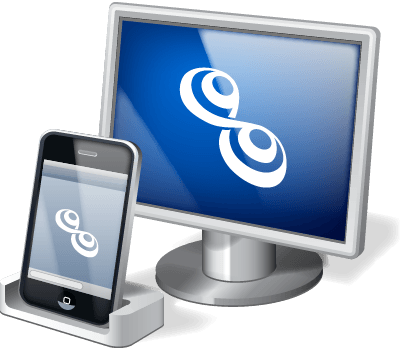 At the same time, the design of Trillian for Mac respects the user interface of Mac OS X, providing you with a seamless experience across your operating system. Trillian for Mac introduces a complete new set of icons to differentiate IM services. Instead of colored spheres, enjoy handsome abbreviated logos representing each service. Icons are displayed on the right side of the contact list to let you easily see which IM services your contacts are on, including for MetaContacts. Easily see how many new unread messages you've received from your contacts, both in the contact list and in chat window tabs. Trillian is a great tool to connect various instant messaging and social networks, including but not limited to AIM, ICQ, Google Talk, Windows Live Messenger, Yahoo! Messenger, and Facebook Chat. You can even connect to multiple accounts within the same IM network. Use the connections panel to set all connections away or back at once, or change them individually under their respective menus. Simply click your status and begin typing right away. You can do the same with your display name. Put the fun back into chat! Bubbles are combined with crisp separators, and icons are displayed only once to avoid needless repetition and space waste. Typing notifications let you know when your contacts are composing a message and vice versa. Using our tabbed chat window, switch between chats with a single click or familiar Mac hotkeys. Tabs also display useful real-time information including avatars, typing notifications and unread message counts. Tabs are designed to act and look like tabs in Mac OS X.
Trillian for Mac is integrated with the built-in spellchecker and dictionary in Mac OS X. No more typos. We’re releasing a minor new Trillian for Mac update today for beta testers. Once everything looks good we’ll submit this to the App Store for everyone else, so please let us know if you find any glaring issues! The bulk of the work in 1.6 will be invisible to users, but we’ve now got a fair portion of the work required to support group chats done. Visible changes in 1.6 include better support for sending images, metacontact windows, the ability to tweak or disable auto away, and the utilization of your address book pictures in the chat window as well as the contact list.